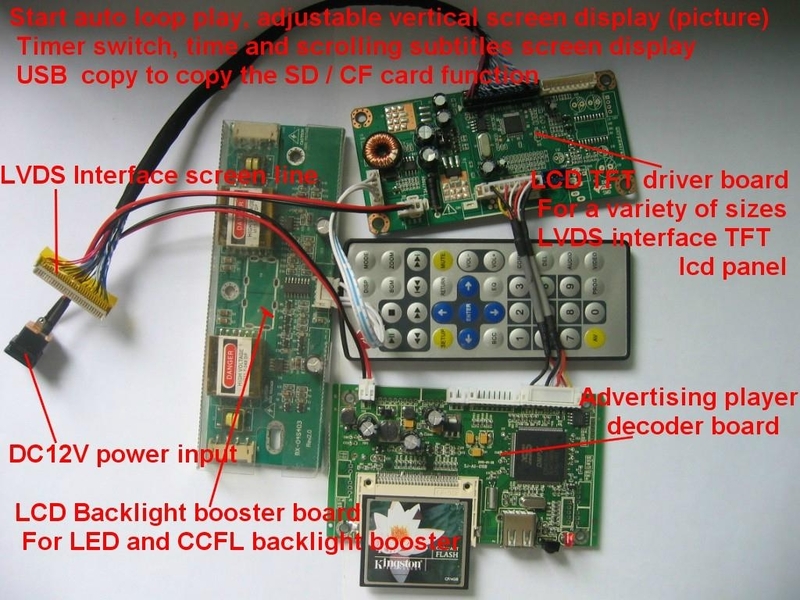 Kit includes: (1) CCFL and LED backlight boost board, suitable for all size LCD screen. (3) advertising dedicated decoder board (with remote control), to support vertical screen image display, menu vertical screen time display vertical screen, vertical screen display subtitles. Start to play automatically, time, timer switch, support U disk one-touch copied, reproduced, delete function. really simple intelligent operation. The company offers packages, customers buy their own LCD screen for customers to save costs, reduce shipping costs, thereby achieving the benefits. This product is mainly used in vertical lift internal screen display, slide show mode of the company image. Also for supermarkets, hotels, outdoor advertising.